Clear snow off your vehicle without scratching! With the SNOBRuM, you can easily push heavy, wet snow off the roof, hood, and trunk without scratching the paint or harming the finish of your vehicle. The SNO BRuM is perfect for drivers living in climates with heavy snowfall. The telescoping handle and oversized head make snow removal quick and easy on any vehicle. Don't go another winter without it! The SNOBRuM is built to be non-abrasive! The durable molded polyethylene foam head has been lab-tested for non-abrasiveness, freeze resistance, center load stress and durability to achieve the highest ratings. The high impact plastic face plate is recessed into the foam to prevent contact with the vehicle. The powder coated steel telescoping handle has special cold resistant nylon threads and extends from 27" to 46" providing maximum reach with no strain on the operator. Use the SNOBRuM on large trucks, SUVs, and vans as well as cars. 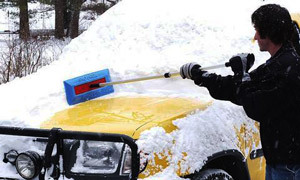 Quickly remove large amounts of snow from your vehicle, without harming the paint, with the Auto SNOBRuM Snow Removal Tool! The SNOBRuM is a time-saver. There's no faster way to move heavy snow from your vehicle so you can get on the road. In addition to automobiles, the SNOBRuM safely removes snow from trailers, awnings, spa covers, and all other surfaces. The SNOBRuM has been satisfying customers for more than 10 years. If it snows where you live, you'll be glad you have the SNOBRuM snow removal tool. I've had one of these for years and love it for cleaning off my car and van. Gets the job done so easy. Going to buy a few for my children and an extra for me. Going to get mine at Home Depot though, a lot cheaper there for same item. ProsVery easy to handle ~ works great. ConsEdges of push pad should be smoother to prevent marring the paint. ... when it's time to get the snow off the cars/trucks after a snowstorm. This is my second one after the first one easily plowed through the snow off our vehicles for six snow seasons. Made in the U.S.A. and a much better quality than the "Joe" brand. Just make sure not leave outdoors when not in use so the handle that opens/closes the extender doesn't get rusted. 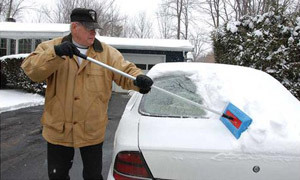 ProsEase of removing snow off roofs and hoods of vehicles. ConsFeeling guilty that the neighbors are struggling to get the snow off their cars while you're the first one driving down the block after the storm! A must-have item in the Northeast for winter. Makes fast work of cleaning off a car. Buy two and keep one inside and one in the car. I left mine in New Hampshire by mistake, and when realizing it, immediately ordered a new one online. Best gear ever for winter weather. Consthe telescoping handle not the easiest to telescope. I use mine as it is. Best Snow Removal Product for Vehicles! This is the best product on the market for removing snow from vehicles - hands down! You can clear the snow off of an entire vehicle in a matter of minutes with this item. It is lightweight and has a generously wide, foam head that is safe for the vehicle's finish. My husband and I bought one for each of our cars, many years ago. We were so impressed that we bought 8 more a year or so later, to give as Christmas gifts for family members. Now I'm ordering another one for a gift exchange. It's a great addition to any Maryland household! ProsLightweight, gets the job done quickly, and lasts for years (as long as you don't abuse it)! ConsI did start having a problem with mine spinning around on the handle. I'm hoping they've made improvements which prevents that from happening.